I’ve known for a long time that Fritz Lang was a ground-breaking movie director (Metropolis for example)–but I’ve never truly appreciated that for myself, until I recently saw his black and white movie about a search for a child murderer, titled M. Fritz Lang described M as a documentary, and I would have to agree with that–it looks, and feels, like a documentary. It takes place in Germany in the early 1930’s, where a child murderer (played expertly by a young Peter Lorre) is loose, occasionally murdering an innocent young girl. The cinematography is excellent – the movie begins with a young girl playing with a ball on the street, bouncing it against a telephone pole; as the shadow of Peter Lorre falls across the pole, and we hear his voice, “That’s a lovely ball you have there.” Shortly afterward, we see the girl’s ball falling to the ground, and a child’s balloon floating away, and it’s visually obvious what horrible event has happened, even before her mother realizes that she hasn’t come home. The unknown murderer is driving the nation to a state of paranoia, where simply talking to a child on the street is enough for a mob to form, and nearly kill someone. The police are working literally non-stop, pursuing every lead–and many false leads–eventually making it so difficult for organized crime, that the criminals decide that it was in their own interest to find the child murderer–and their own brand of justice. They use all of the resources at their command, all the way down to the street beggars. This is where the iconic “M” of the title comes in–one of the beggars marks a large capital “M” on his palm with chalk, and claps it firmly on Lorre’s back, literally marking him for the other beggars to follow. At the same time, the police are closing in on him, but the criminals find him first, hiding in a building, where the criminals hold nothing back in finding him, and they decide to put him on “trial”–for his life. 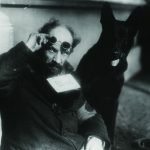 I won’t give away the ending, but I will say that the entire film builds up to this point–and brings up a valid issue that we’re struggling with more than 80 years later: if they turn him over to the police, and some psychiatrist declares him “cured”–he will be free again to commit murder. M is an excellent movie, and highly recommended for adults. Even though it was filmed in the 1930’s, the language is not appropriate for younger ears. 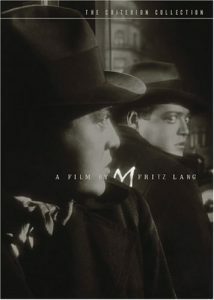 On moratorium since the end of March, Fritz Lang’s serial killer thriller starring Peter Lorre returns to DVD in a fully restored, special edition double-disc set. A simple, haunting musical phrase whistled off-screen tells us that a young girl will be killed. 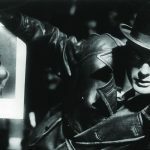 “Who is the murderer?” pleads a nearby placard as serial killer Hans Beckert (Lorre) closes in on little Elsie Beckmann”¦ In his harrowing masterwork, Lang merged trenchant social commentary with chilling suspense, creating a panorama of private madness and public hysteria that to this day remains the blueprint for the psychological thriller. 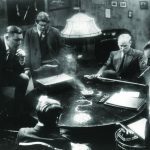 The Criterion Collection is proud to present a new restoration of this landmark film in an all-new two-disc set, also including audio commentary by two German film scholars; an interview film Conversation with Fritz Lang, directed by William Friedkin (The Exorcist, The French Connection); a short film inspired by M by director Claude Chabrol (La Ceremonie, Les Biches); classroom tapes of M’s editor discussing the film and its history; and much more. Children: [singing] Just you wait, it won’t be long. The man in black will soon be here. With his cleaver’s blade so true. He’ll make mincemeat out of you! Hans Beckert (Peter Lorre): That is a nice ball you have. Frau Beckmann: Elsie? … Elsie? …ELSIE! Beggar’s Union Member: Stop snoring! You’ll wake up the lice. Franz, the burglar: [Franz is being tricked into thinking he killed the night watchman, and is going to jail for it] Please, Herr Kommissar! I’ll tell you everything; even who we were looking for in that damned building. Franz, the burglar: The child murderer, Herr Kommissar! Criminal: The old story! We never can help it in court! Hans Beckert (Peter Lorre): What do you know about it? Who are you anyway? Who are you? Criminals? Are you proud of yourselves? Proud of breaking safes or cheating at cards? Things you could just as well keep your fingers off. You wouldn’t need to do all that if you’d learn a proper trade or if you’d work. If you weren’t a bunch of lazy bastards. But I … I can’t help myself! I have no control over this, this evil thing inside of me, the fire, the voices, the torment! Schraenker: Do you mean to say that you have to murder? Inspector Karl Lohmann: In the name of the law. Grieving Mother: This won’t bring back our children. We, too, should keep a closer watch on our children. The tune that Peter Lorre’s character whistles is “In the Hall of the Mountain King” from the “Peer Gynt” suite by Edvard Grieg. Peter Lorre was Jewish and fled Germany in fear of Nazi persecution shortly after the movie’s release. Fritz Lang, who was half Jewish, fled two years later. In Germany, the Nazis banned the movie in July 1934. Contrary to popular belief, Fritz Lang did not change the title from “The Murderers are Among Us” to “M” due to fear of persecution by the Nazis. He changed the title during filming, influenced by the scene where one of the criminals writes the letter on his hand. Lang thought “M” was a more interesting title. Fritz Lang asserts that he cast real criminals for the court scene in the end. According to biographer Paul Jensen, 24 cast members were arrested during filming. Fritz Lang’s cruelty to his actors was legendary. Peter Lorre was thrown down the stairs into the cellar over a dozen times. When Lang wanted to hire Lorre for Human Desire over two decades later, the actor refused. Chosen by the Association of German Cinémathèques as the most important German film of all times. The use of voice-over narration was a groundbreaking new technique at the time. The title “M” is short for Mörder, the German word meaning Murderer. Director Fritz Lang made this film in an effort to claw back his artistic standing after the double failure of his two previous films, Metropolis and By Rocket to the Moon. Director Fritz Lang has said this is his favorite of all of his films. Fritz Lang’s first sound film. Before making this, Peter Lorre had mainly been a comedic actor. The film has a very sour vision of contemporary life in Germany. This is probably due to the fact that Fritz Lang – a Jew – was alarmed at the rapid rise of Nazism and that even his wife Thea von Harbou had become a party member. Peter Lorre couldn’t whistle well so the whistling of “In the Hall of the Mountain King” heard in the film was actually done by Fritz Lang.